Valdivia, again, played well and seems at ease. His interview earlier this week also points in that direction. Maikon Leite is a game changer when he comes on. If only his speed could be matched by ability, we’d be having a new Messi in our hands. Daniel Carvalho may be out of shape but is clearly showing quality. A few kilos lighter and motivated, this chap might be the exclamation mark of the season. Ricardo Bueno… Could go either way. Against Portuguesa he wasted heaps of chances before scoring the equalizer toward the end. Mark him for the goals he didn’t score or credit him for the ball that actually found its way to the net? I’ll stick with the second option for now, believing that Ricardo might actually prove to be just that: bueno. A bit of money might be rolling in soon. Talks seem to be progressing with the Chinese car manufacturer Jac Motors after they made an offer worth approximately US$11 million a year to become master sponsors of Palmeiras. If the deal goes through, Jac would be replacing Fiat on the Palmeiras jersey – a sublime but important message in itself. Former Palmeiras darling Vagner Love’s return to Flamengo will also feed our moneybox; roughly US$850.000 are earmarked for Palmeiras in the US$10 million deal with CSKA. As Love was primarily brought up at Palmeiras, 3.5 per cent of any transfer money go to the club (the other 1.5 per cent are split between Vasco da Gama and Bangu). An additional 5 per cent will go to Palmeiras as part of the deal struck with the Russians when Love first transferred to CSKA. Anything Palmeiras wishes Vagner Love good luck a dreadful year at Flamengo. Historically, Palmeiras have had trouble playing at home against weaker and defensive line-ups. With this in mind, the directors have asked WTorre to study a way to expand the size of the pitch on match days. The pitch of the New Arena is currently tailored to comply with FIFA World Cup standards: exact 105 x 68 meters. However, the maximum size permitted by FIFA are 110 x 75 meters. 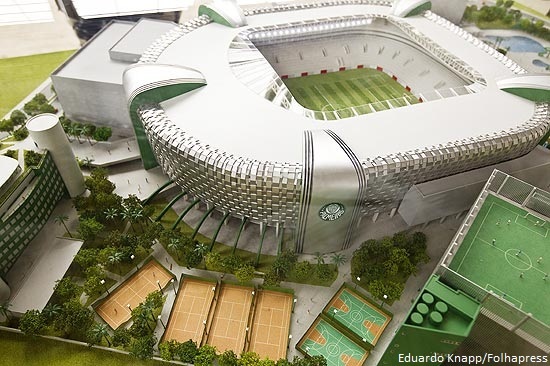 Thus, WTorre are looking for the smartest solution in order for Palmeiras to be able to quickly change the size of the pitch when deemed to their advantage. Maikon Leite is way better than Tinga (who went out for his substitution) i really dont know what is going on Felipaos mind. He shoud start the game whit Maikon. I agreed whit everything you said but for me the poor middle players make very dificult to play against teams with advanced formation of pressure such as Portuguesa out of Caninde. I agree with you, but not completely. Tinga has been used by Scolari as playmaker, but he also has an important defensive role, something completely out of the question when we talk Leite. Considering that Valdivia does little defensive work and Assunção… Well, he’s important to the team but not really lightning fast anymore. Starting with Maikon instead of Tinga might leave Palmeiras very vulnerable. At least that’s Scolari’s reading. The curious thing is that people who have been to the training sessions claim that when Scolari tests Tinga as a purely defensive midfielder, the quality of his play increases dramatically. Unfortunately, we’re not seeing him opting for this during matches. Let’s see in the future. And let’s see what happens when Barcos and, especially, Daniel Carvalho find their rhythm.